Supina is a HTML/CSS/JS framework that helps you quickly build modern, beautiful and accessible user interfaces for interactive web applications. It is powered by jQuery, Twitter Bootstrap and a bunch of other curated widgets & plugins. 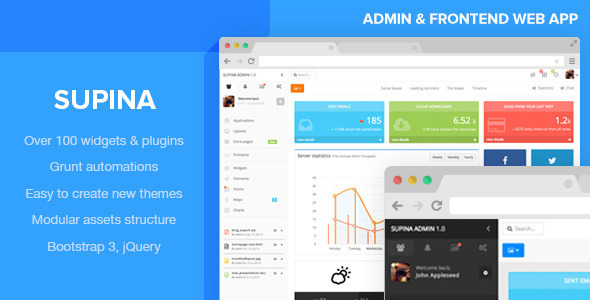 Supina includes a lot of UI interactions, effects, elements, components and themes. These featured make it a very powerful companion when it comes to solving all kinds of use cases. Read through the documentation to get an idea of how many widgets and elements are available. This entry was posted in admin-templates, site-templates and tagged admin, admin dashboard template, admin template, admin themes, backend admin, frontend templates, premium admin templates, web app, web theme by Acty. Bookmark the permalink.